The MARK of the BEAST may soon be enforced! 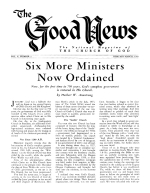 Unreported on the front pages of your daily newspapers is a startling CALENDAR REVISION - a change that will abolish the weekly cycle and the seventh-day Sabbath! THE "MARK of the BEAST" is here now! Though it has not been enforced in our generation by the power of the Church or the State, IT SOON MAY BE! It may cost you your job - perhaps your life! Almost no one seems to realize what rapid developments are taking shape in revising the calendar! Well on the way to being adopted is the cleverest plan yet devised to destroy God's Sabbath. This diabolical plot to CHANGE the weekly cycle, which has continued unbroken from creation, is being proposed under the subtle guise of a "scientific, uniform, stable and perpetual" World Calendar. Bur there is another, more sinister, reason for changing the calendar!